wonton surrogates.... I'm still laughing! is that like egg rolls or crab rangoon or something? Thief! 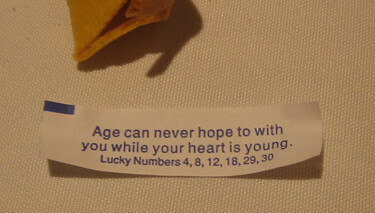 That was my fortune. My heart was hope while aged ewes frollicked facetiously. I think I had too much wine. My pal and I were laughing over that error earlier; I said that if i were to have a baby, I would definitely use a wonton surrogate. Just think: the baby would likely come pre-swaddled!